Not surprisingly, the Better Bodies that returns as the single branded result on Google is the gym that is located within a mile of my house. There is another Better Bodies located just under six miles from my house and a third location in downtown Indianapolis. My point in doing this exercise is to show that if the owner of Better Bodies lived in my neighborhood, and he searched the brand name of his business on Google, only one of his three locations would return as a result. This scenario can be maddening for small business owners, who don’t understand why Google isn’t displaying all (or any) of their locations. Nevertheless, don’t be fooled into believing that this search phenomenon is only occurring among competing franchised locations, as with my client, or small businesses, as with the Better Bodies example. Another example of this local SEO mystery occurring in my local search area involves a rather large regional bank. 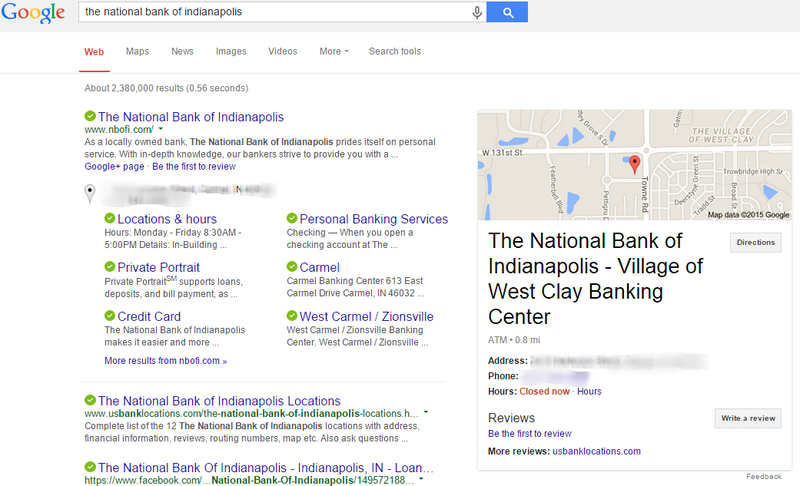 Notice in the image below, when I searched for the branded keywords, “National Bank of Indianapolis” a single branded result is provided via a Google search. Why is Google not displaying all business locations in search results? Anna Seacat provides steps that business owners can take to improve their presence and standing in Google’s search results. This scenario is somewhat worse for the National Bank of Indianapolis than with the case of Better Bodies. Unlike Better Bodies, whose alternate locations were in different towns than the one located within a mile of my house, The National Bank of Indianapolis has four locations within my town’s limits. Nonetheless, only one is displayed when I search for the brand from my home computer. SEO | Why is Google Not Showing the Location of My Business? Search engine marketers speculate that the cause behind only one business being displayed on Google’s map, rather than multiple businesses (“multi-pack”), is partly due to Google’s focus on user intent and mobile. GOOGLE’S HUMMINGBIRD: A FOCUS ON USER INTENT – Only one business being turned up as a result on Google’s search results started appearing after its Hummingbird algorithm update. According to Joel Popoff of Powered by Search the purpose behind Hummingbird was to move away from using keywords and, instead, use “facts about people, places, and things and how these entities are all connected.” In other words, user intent is decided by Hummingbird through a consortium of knowledge Google has about the searcher, including the location of the searcher. Therefore, if I am using my home computer to search for “Better Bodies,” the Hummingbird algorithm will assume that the Better Bodies located within a mile of my house is the one I was looking for (my intent). Conversely, if I were using my mobile device while covering a conference in downtown Indianapolis and searched for “Better Bodies,” the algorithm would understand that my intent was to find that Better Bodies location instead of the one close to my house. …businesses that are not relatively close to the searcher are less likely to show up. SEO | What Can I do if Google is Not Listing my Business? 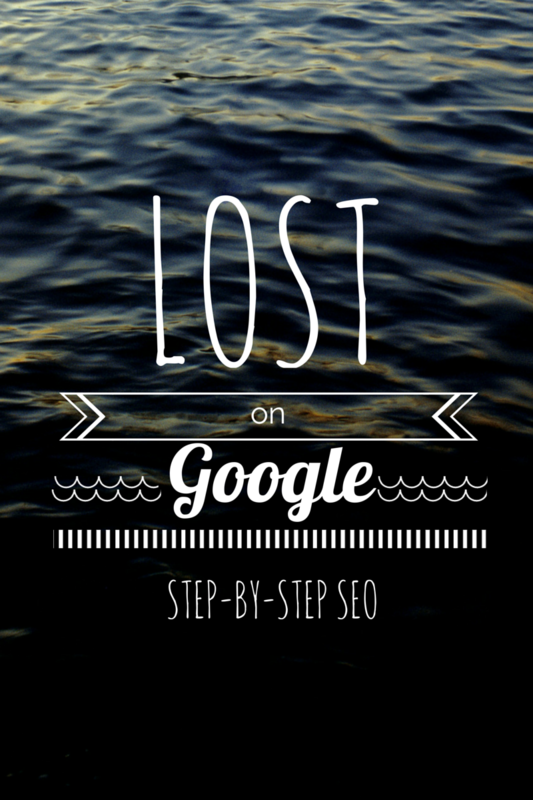 Anna Seacat provides step-by-step SEO instructions for businesses not showing up on Google search results. So, let’s return to my inspiration for writing this article – my client who was panicking about not seeing his business after searching with his franchise’s brand name from his home computer. I don’t know for sure, but I’m fairly certain he was not happy with my explanation for why this is occurring (Hummingbird, Pigeons, he probably couldn’t care less about Google’s algorithm). He only wanted to know what he could do to change it. If you too are not trying to figure out why your business is not showing up on Google’s search results, but how you can change it, below are my step-by-step instructions. More importantly, his own customers wouldn’t call his business by that name – it’s not real world, and it is hurting his SEO efforts. One important note: It is important to represent the name (title) of your business in GMB as anyone in the real world would recognize it. In other words, if a searcher saw your business’s sign from the street what does it read? That is what you should have listed on your Google+ and Google My Business registrations as your business name. This becomes a huge problem in the franchise world. In fact, my aforementioned client and I passionately disagree on this point. From a search marketing perspective, I want him to list his branded name as the title within Google+ and GMB. However, he uses the nonsense name that the franchisor gave him, which includes the directional word, “Southeast.” The problem with this is that the title given by the franchise, which includes the word “Southeast,” doesn’t make sense to Google. More importantly, his own customers wouldn’t call his business by that name – it’s not real world, and it is hurting his SEO efforts. According to search expert Mike Blumenthal, Google has even clarified that your business’s name, and nothing but your name, should be used as the title. For instance, “Google Mountain View Corporate Headquarters” is incorrect if following GMB guidelines. It should just read “Google.” “Orlando Airport Marriott Northern Lakeside” should just read, by GMB standards, “Marriott.” “Orlando Airport Northern Lakeside” is just franchise speak. Customers don’t speak or search that way, so Google doesn’t recognize it. All of the scenarios I described above — my client’s search and my search for “Better Bodies” and the “National Bank of Indianapolis” – were all conducted by using only the business’ brand names and, here is the important part, no specific location. 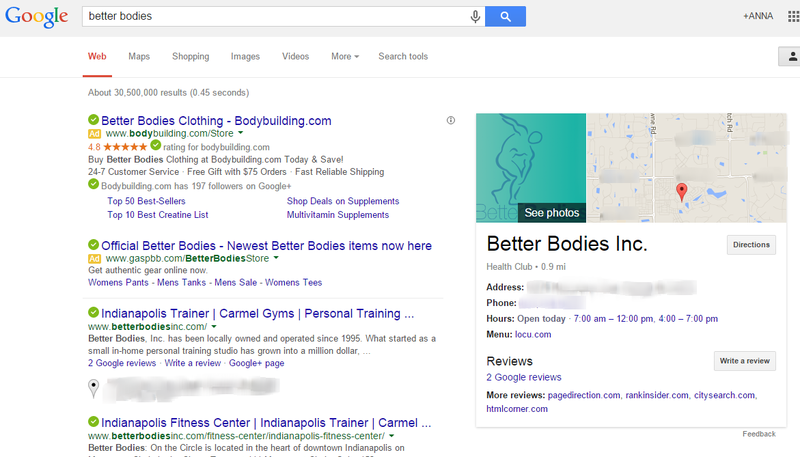 I only searched “Better Bodies,” not “Better Bodies Indianapolis.” If, for instance, I specify location in my query by searching “National Bank of Indianapolis Carmel” a 3-pack Google map result is displayed rather than the one box listing, as shown earlier. What can you learn from this? Maybe what is more important to ask is what has Google learned? It is easy to see, since Google has adjusted its algorithm so severely, that consumer intent is tied very strongly to whether or not a geographic indicator is used. If searchers leave off a geographic location (usually a city or town) in their search and only use the brand’s name in the query, they more than likely are looking for the business that is located closest to them at the moment of the search. …unless there is a specific problem with one location over another, consumers will likely shop where they can get instant gratification (closest). So, try and be realistic about consumer behavior. If a searcher is typing the brand name of the franchise you belong to, recognize what type of searcher this is and what stage they are in the purchasing process. 1) They have recognized a problem that needs solved, 2) researched possible solutions, 3) narrowed the solutions down to specific suppliers (brands), and are either researching each specific brand or ready to buy from your brand. Naturally, you want to capture these ready-to-buy customers. But, be realistic about the purchasing process and the nature of modern online consumers. If they are aware of your brand and see it as the best possible solution, through their online research, they are probably also aware that there are multiple locations near them. Moreover, unless there is a specific problem with one location over another, consumers will likely shop where they can get instant gratification (closest). I’ve already outlined above that Google’s Hummingbird and Pigeon updates have created a scenario where the searcher’s intent and location are paramount, when using a brand name query. And, being realistic about that fact is a critical step, because it allows you to consider more valuable, long-tail keywords. Along those lines, there is a third factor within Google’s algorithm that should be recognized when trying to rank better within local searches. It has been noted by Shotland (Local SEO Guide) that Pigeon most likely has an “over-weighting of brand.” In other words, businesses that own the URL for a long-tail keyword will rank higher than those with a brand name URL. For example, when I search “Hardware store” from my home computer, not only does my local Home Depot not return as a result in the 6-pack, but Ace Hardware Store’s organic listing is above the pack, the first listing in the pack, and the first organic listing below the pack. If Better Bodies would invest in Google AdWords Express, they would not only be at the top of the pack in the form of a Google Ad, but would also be displayed prominently on Google Maps. There are some great success stories about how small businesses can achieve greater online presence with Google AdWords Express on the Google Ads site. Long gone are the days when the “If you build it, they will come” mentality worked. In fact, with Google’s most recent algorithm updates, small businesses’ websites are disappearing from search results. However, there are steps that business owners can take to improve their presence and standing in Google’s search results. Above, I listed optimizing with Google My Business, taking a realistic perspective on user intent, expanding your keyword focus, and investing in Google AdWords Express as possible steps to take. You have made some good tips and tricks. It is a great post I really loved it because it gives us some important information about some important local SEO and getting my business to show up on google.